Approved by AQA, this student book offers high quality support you can trust. Written by renowned author Anita Tull and Garry Littlewood, this resource is designed to be the most motivating student-friendly book available. Its engaging visual style and tone will support your students through this new course and help them thoroughly prepare for both their non-examined assessment tasks and exam. / Designed for students of all ability level. / Knowledge and understanding covers the specification content in the right level of detail and is written and presented in a highly accessible way. / Recipes make the links between food preparation skills and the science of food and nutrition. 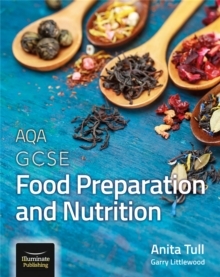 / Practical activities help your students connect theory and practice, and apply their understanding of food and nutrition to practical preparation. / Non-Exam Assessment tasks are supported with a chapter giving you clear guidance on how you will be assessed./Exam practice and skills guidance is provided, introducing students to the assessment criteria and mark schemes. / Extension questions and tasks will help stretch and challenge the most able learners.